This classic Moroccan recipe is prepared by baking chermoula-marinated whole fish with potatoes, carrots, tomatoes, and green peppers – the result is zesty, saucy and delicious. Serve directly from the baking dish with Moroccan bread for a complete one-dish meal. Use any firm, white fish such as sea bass, red snapper or orange roughy. Be sure to slice the potatoes and carrots quite thin so that the vegetables will be tender by the time the fish has finished cooking. 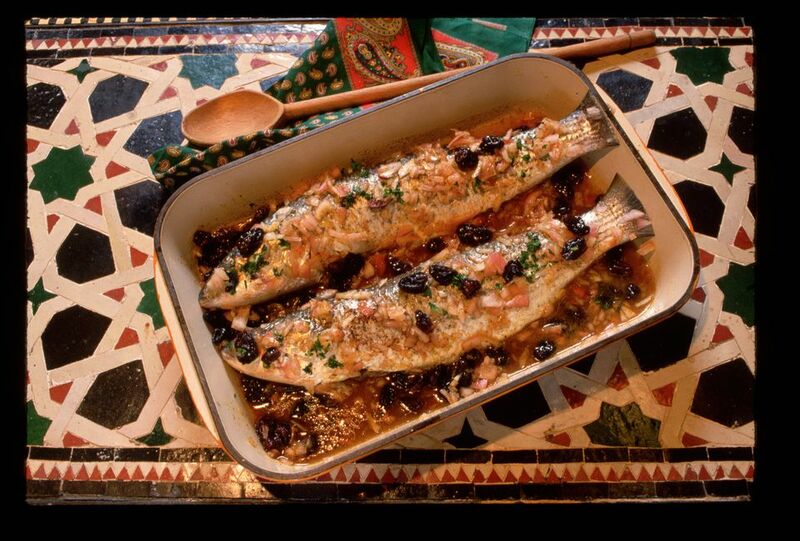 For stove top preparation in a traditional tagine, see this Fish Tagine Recipe. Wash and dry the fish. Mix all of the Chermoula ingredients, adding a little more lemon juice or vegetable oil if necessary to thin the marinade. Taste and adjust the seasoning so that the chermoula is as salty, lemony, and spicy as you like. Reserve a little more than half of the chermoula, and use the remaining chermoula to marinate the fish, rubbing the chermoula over the outside of the fish and inside the cavity. Preheat an oven to 425° F (220° C). Lightly oil a baking dish with olive oil. Distribute the carrots over the bottom of the dish, crossing them to create a bed for the potatoes and fish. Add the potato slices in a single layer and season them to taste with salt, ginger, and pepper. Place the fish in the baking dish and arrange the tomato slices on and around the fish. Thin the reserved chermoula with 1/4 cup of water and several tablespoons of olive oil, and spoon the mixture over the fish and vegetables. Top the fish with the green pepper, lemon slices, chili peppers and olives. Cover the fish with aluminum foil and bake for 25 minutes. Remove the foil, and continue baking for another 20 to 30 minutes, until the fish and vegetables are tender. If the liquids in the dish have not reduced to a thick sauce during the baking, you'll want to do this on the stove. Carefully pour out the liquids into a saucepan and cover the fish to keep warm. Reduce the liquids to a thick sauce over medium to medium-high heat and pour immediately back into the baking dish. Garnish with the chopped parsley and serve.